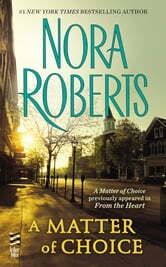 A novel of peril and passion from #1 New York Times bestselling author Nora Roberts. The last thing NYPD Sergeant James “Slade” Sladerman needs is to babysit a spoiled heiress. But Jessica Winslow’s antiques shop is suspected of being used by an international smuggling ring, and Slade is being sent undercover to investigate—and keep Jessica out of trouble. A Matter of Choice previously appeared in From the Heart. All of Nora Roberts books are good. I especially like this book it was good from the beginning until the end. This book was hard to put away. Good story line as always. This would have made a really good fully rounded book. Typical Nora Roberts. I love all of her books. This was a nice, easy read,with thoroughly likable characters. Simply loved it. Nora Roberts is one of my favorite authors. She's brilliant in my opinion. I have never read a book of hers that I didn't like. That includes her writing as J D Robb. An obscenely overblown piece. Far too many words for such a BASIC story. Boring sums it up to near perfection.